Two superb early 19th century proof sets which are on the market for the first time in almost 80 years will be among the highlights of the auction of Coins, Historical Medals and Paper Money to be held by the international specialists Dix Noonan Webb in London on 13 to 14 December 2017. The sale will also include a fine selection of English Five Guineas gold coins with dates ranging from 1692 to 1729. 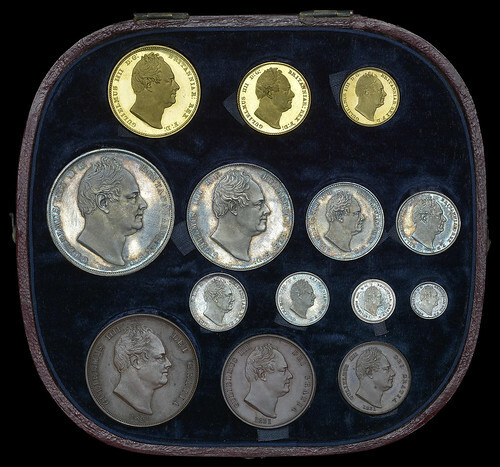 A proof set of eight coins bearing the head of George IV and dated 1826 is expected to sell for £100,000 to £120,000. The set comprises four gold coins – Five and Two Pounds, Sovereign and Half-Sovereign – and four silver coins – Crown, Halfcrown, Shilling and Sixpence – displayed in a 19th century custom-made gilt-blocked case. The catalogue describes the set's condition as “minimal hairlining, about mint state and brilliant, the silver with dark matching tone”. The set was last on the market when it was auctioned on 24 February 1938 selling for £35. It has remained with the family of the purchaser ever since. The second proof set, which comes from the same source, is from the reign of William IV and is dated 1831. 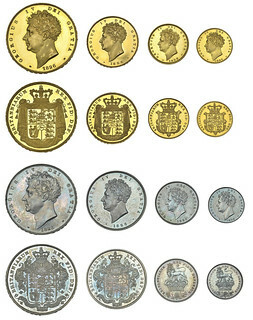 The 14 coins in the set comprise gold Two Pounds, Sovereign and Half- Sovereign, silver Crown, Halfcrown, Shilling, Sixpence and Maundy set and copper Penny, Halfpenny and Farthing. All are housed in a contemporary maroon fitted case. The catalogue describes their condition as “gold and silver with some light handling marks and hairlines, particularly on the larger coins, the silver with matching tone, these better than extremely fine and brilliant, the copper similar but a little cloudy”. The set has not appeared on the market since 4 March 1938 when it fetched £33 at auction. It has remained with the family of the purchaser ever since. It is expected to sell for £40,000 to £50,000 at the Dix Noonan Webb sale. 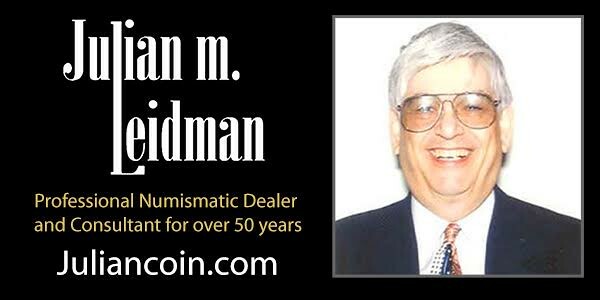 A selection of five gold Five Guineas coins will also be auctioned by Dix Noonan Webb. Two, bearing the head of William III, date from 1701 and are estimated at £20,000 to £26,000. Another, carrying the same estimate, is from the reign of George II dated 1729. A William III coin dated 1699 is expected to fetch £14,000 to £16,000 while another Five Guineas with the joint heads of William and Mary and minted in 1692 is estimated at £12,000 to £15,000.